Rose Avenue 2012 --- Though staggered by the reoccurring floods, the town is staggering back to life with a new headquarters for the Electric Cooperative opening in 2011, and an entire new school system opening in the fall of 2012. The first settler in the Upper Nehalem Valley area was Clark Parker who chopped his way into the area and homesteaded in 1874. His Homestead was on the East side of the Nehalem River (Riverview). He came in from the Washington County side. He was followed in 1875 by the VanBlaricom's who homesteaded along Rock Creek in the what is now the main part of town. Other historic names in the community followed soon thereafter including, Spencer, Mellinger, Pringle, Weed and Cherrington. Vernonia was named for the daughter of one of the original settlers, Ozias Cherrington who moved there in 1876. Her name was Vernona. She was born March 30, 1868 in Ohio and later moved to Virginia. She never came to Oregon. It is reported that Cherrington's co-settler, Judson Weed wanted to name the community Auburn for his home town of Auburn, Minn., however, he was from Ohio so the report cannot entirely accurate. The political voting precinct was called Auburn for many years, but finally renamed to Vernonia to avoid confusion. Irrespective of this report Judson Weed was important in the founding of the city of Vernonia as is shown by this excerpt from his bio written in 1928: Judson Weed attended the public schools of Jackson county, Ohio, and the National Normal School at Lebanon, that state, after which he taught school for several years. In 1875 he went overland to San Francisco, California, thence by boat to Portland, Oregon, and taught school for one year in Linn county, this state. In 1876 he took up a homestead of one hundred and sixty acres four miles southwest of Vernonia, Columbia county, all of which was covered with heavy timber and brush. He first built a small house of split cedar boards, there being no sawmills in this locality at that time, and then entered upon the task of clearing the land. 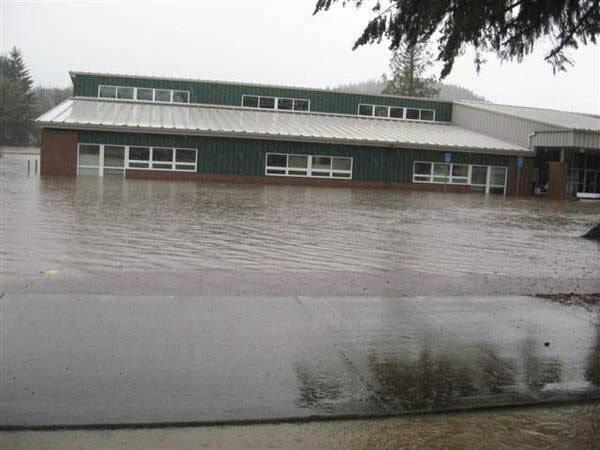 He also taught school for several years and so greatly was he interested in the advancement of the educational interests of the community that he helped to build the first schoolhouse in Vernonia district, and was the second teacher there. HE cleared and put under cultivation about fifty acres of his land, planted a good orchard, and for many years gave much of his attention to raising cattle, stock cattle at first, but later dairy cattle, mainly Jerseys. His principal crops have been hay and vegetables, and in the operation of the ranch he has met with very satisfactory success. During the years that he has lived here he has made many permanent and substantial improvements and now owns one of the best farms in this section of the county. He married Emma Van Blaricom in 1879, the daughter of another early homesteader. The Vernonia post office was established Jan 11, 1878 with David F. Baker as its first postmaster. The first road out of the upper valley to the North was opened with volunteer labor apparently in 1879. 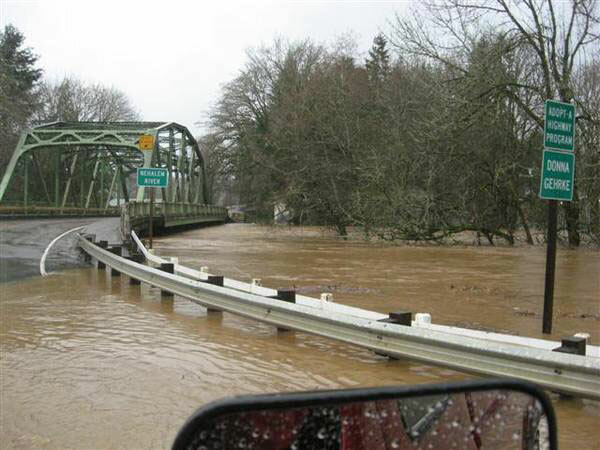 It reached the Nehalem Valley at Pittsburg which is located at the confluence of the Nehalem with the 'East Fork'. It was a dirt wagon road and is known today at the 'St. Helens-Pittsburg'. Hardship did not go away with the opening of the road however. In January of 1880 a violent windstorm closed all roads into the valley by toppling them full of trees. The wind was followed by extraordinary snow and the area was reportedly isolated for months. Weekly mail service between St. Helens and Vernonia began shortly after the road was opened and by 1891 was said to have grown to 3 times a week. Bill Pringle, who told of running freight between the places, spoke of leaving Vernonia early in the day with a wagon of produce for shipment to St. Helens, getting it unloaded, and the wagon reloaded for a return trip before turning in for the night in the St. Helens area before returning. 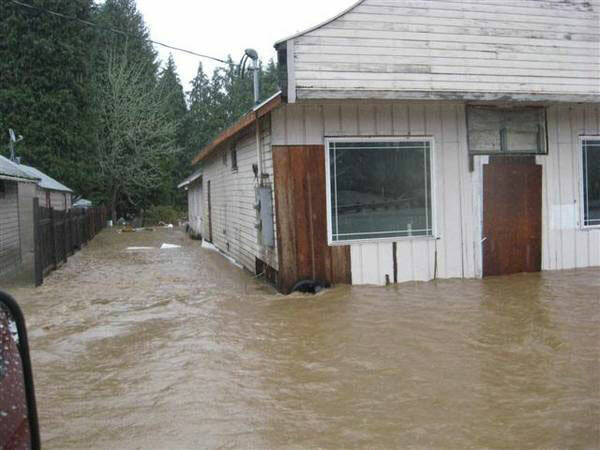 While it was June of 1894 that provided the 'record' flood on the Columbia River, it was the next year that was the challenge for Vernonia. 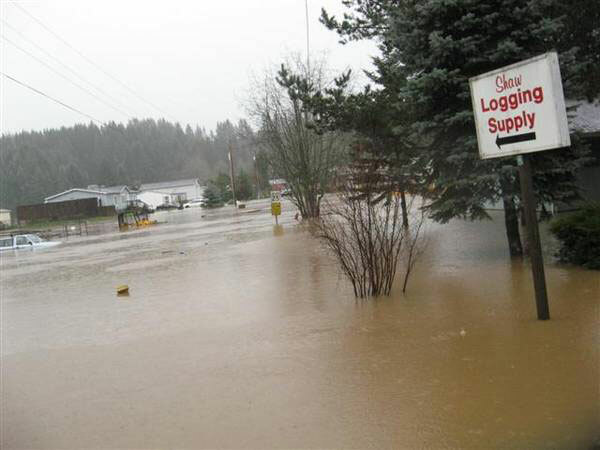 Bunker Hill saw 5 feet of snow and in January of 1895 the first great flood swamped Vernonia to a level not surpassed until the great flood of February 8, 1996 over a century later. Vernonia's heyday began in the 1920's when it was the site of the Oregon-American Sawmill, billed at the time as the largest in the world, which was fed by logging railroads in all directions, but alas, by the early 1950's the virgin timber was gone and so was the mill. The timber has grown back, but there is no mill in Vernonia now. The company came in from the South and brought a lot of Southern folks with them. This explains why the plat of the Oregon-American Subdivision features streets named after States in the old Confederacy. 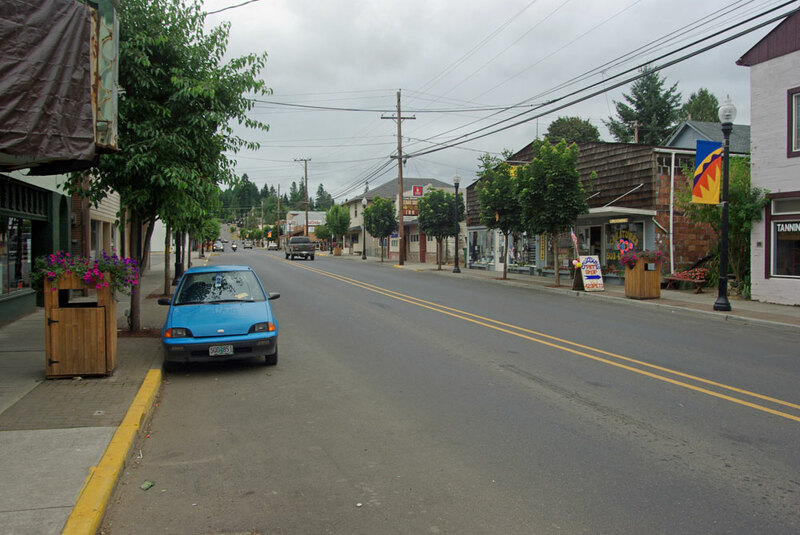 While the Oregon-American Mill in Vernonia neither started the town nor killed it, a discussion of the town cannot be complete without talking about it. 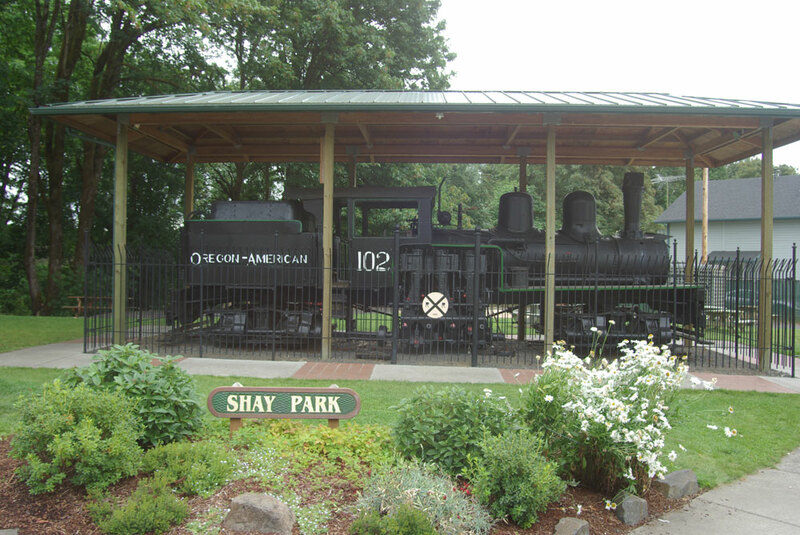 When it comes to lumber and railroads, the story at Vernonia cannot be separated. Earlier logging operations had focused on hauling logs to the Columbia River where they were rafted and sold to mills along the river, where the product was often shipped by lumber schooner either to the growing California Market or shipped East via the Panama Canal. 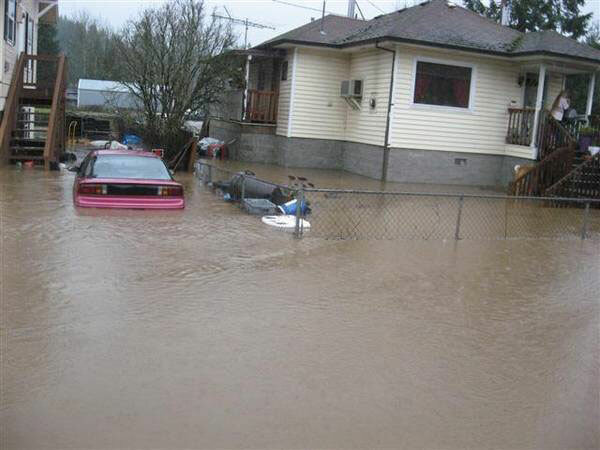 The vision for Vernonia was different. The story more or less starts with David Eccles of Ogden, Utah and Baker City Oregon. He was a major stockholder Construction company that built Western Pacific Railroad which built the rail connection between Salt Lake city and Oroville, California. Wearing his lumberman hat he built the Sumpter Valley railroad, a narrow gauge line that departed Baker city for Prarie City, Oregon, and also the Mt. Hood Railroad designed to support a mill at Dee, Oregon. Though the senior David Eccles died in 1912, his business was carried on by his sons. They were familiar with the area as the family construction company had worked on the construction of the rail line out of Astoria which ultimately was built along the edge of the Columbia River to Goble where it connected to the Northern Pacific main line, but not before an inland route up the Lewis and Clark River had been promoted by the Astoria interests. David C. Eccles and various other family members and parters incorporated the Oregon-American Lumber Company in Utah, in 1917 for the purpose of buying the DuBois tract which included 22,000 acres in the far south west corner of Clatsop County--an area lying north of what is now the Sunset Highway rest area. Buying the property was only part of the problem, however, as that area was about as far from every where as you could get. Of interest to Eccles was the United Railways line which had been built from Burlington under Cornelius Pass which then ended at Wilkesboro just south of Banks, Oregon. It had been started in 1906 with a vision of being an interurban line between the Tualitan Valley and Portland, and purchased to James Hill in 1909 as feeder for the then young Spokane, Portland and Seattle Railway, a jointly owned subsidiary of the Northern Pacific and the Great Northern Railway. It had the incidental benefit of annoying the Southern Pacific that was throughout the Tualitan Valley and who was building a line to Tillamook, partly to block the Northern Pacific from building down the Oregon Coast. Pretty much by 1917 Hill wanted rid of the United Railways which was electrified, but ended up in 1920 leasing it to the Portand, Astoria and Pacific Railroad, a railroad created by the Eccles group for the purpose of extending the United Railway into Vernonia and beyond. A recession in 1920 caught the Eccles family fighting with one another, and they began to crumble financially. A portion of the Dubois property was sold to Inman-Poulsen, a later in 1921 the balance of the holders were sold to Central Coal & Coke who was a large Midwestern lumber dealer who was looking for a western lumber supply because sources of southern pine which they had been relying on were dwindling. Central Coal & Coke didn't want to own a common Carrier Railroad, and ultimately the S P & S agreed to buy the railroad and extend it through Vernonia and on to the Clatsop county line, if Central Coal & Coke would build a sawmill in Vernonia and promise to ship their lumber on the rail. Construction struggled forward on the Railway, and plans for a tunnel under Tophill were abandoned due to geological instability, but the rail line to Vernonia was finally completed in August 1922, and shortly thereafter tracks all the way to the county line were opened and logging began in the fall of 1922 just in Clatsop County beyond Keasey. Prior to this Vernonia was but a remote village of 150 people at the end of 30 miles of dirt road. The construction workforce for the mill was 200 men. The mill added housing and the mill pond began receiving logs in the spring of 1925. By 1929, the mill had 495 employees. By 1931, the mill collapsed into bankruptcy, and was closed until 1936 when a reorganization plan and a $700,000 federal loan got the mill going again. It then operated until 1957 when the lst of the old growth timber was cut, and the mill closed forever. 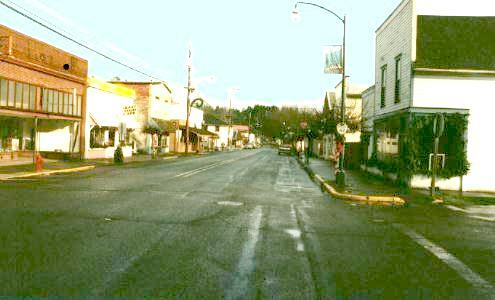 It is reported that some southern traditions also came to town which included the establishment of a 'black section' of town which was down by river behind what is now the Vernonia High School. The mill is said to have kept this part of the mill town 'segregated' by not allowing any of the buildings in that area to be painted or whitewashed. This area is all long gone now. 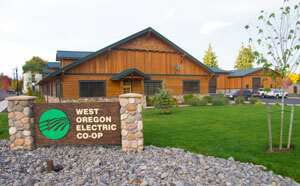 West Oregon Electric's headquarters is located in Vernonia and it is the only incorporated city served by West Oregon. In a way, it's orgin is connected to the mill as well. The Mill was a steam and electric mill with a powerhouse that made steam and electric power. Although an investor owned utility sold power around town some of which came from a small hydro facility in Rock Creek, most of the power came as surplus power from the mill powerhouse. There was some electric power in Vernonia as early as 1923. by 1940, however, the demands of the mill and the city were too much for the powerhouse and in 1943 the mill notified the utility of an intention to cancel the surplus power contract. West Oregon Electric Cooperative was incorporated in 1945 for the purpose of securing an REA loan from the federal government to finance the construction of a transmission line into Vernonia connecting it as last to the outside world. This was accomplished, and West Oregon began functioning in 1946 when the line from Warren to Vernonia was energized. See also Columbia County Railroad History on this site. The area suffered from devastating flooding in 1996, with the flood waters reaching about 4 feet higher than the previously highest recorded flood which was more than a century before in 1895. 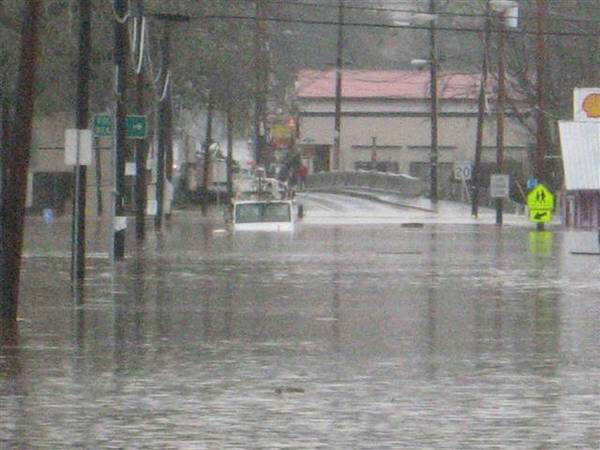 It's now history, that on December 3, 2007, the great flood of 1996, dismissed as a 500 year event returned in spades with up to 12" of more water than appeared in 1996. The waters crested after dark but some just before dark photos follow. 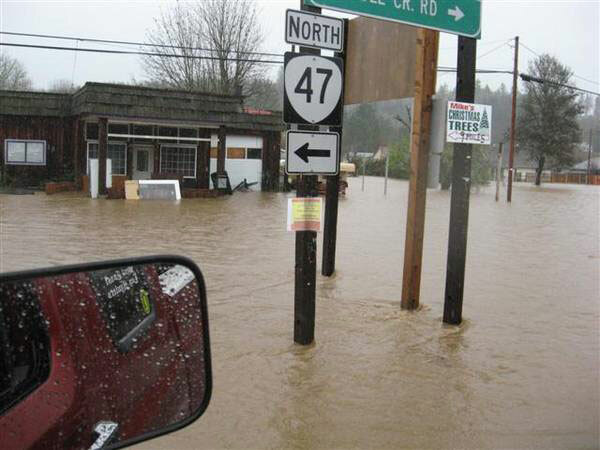 Five years out from the last horrible flood, Vernonia is physically, if not emotionally is beginning to heal. The local electric utility has a new substation on a hill south of town and a new headquarters building in an abandon railyard at the town's south entrance. 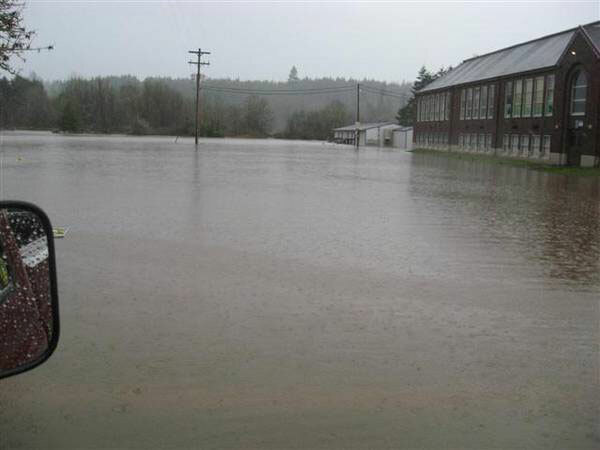 All Three schools of the Vernonia School district have been abandoned and a new school facility has open on O-A Hill well above the flood levels. The trend begun after the 1996 flood of elevating flood risky home has continued with many more being elevated after the 2007 flood, and the city is trying to come to grips with its flood prone waste water treatment facility.